One: It’s a great day to be here. All: There are so many things we can do to serve the Lord. One: Just listen for God’s call to you. Let God guide your life. All: We are willing to open our lives to God’s service. One: Come, let’s worship and celebrate God’s good news for us. After prayers, sing the Children out – “Jesus Loves Me.” Children 5 and under are welcome to remain in worship or go to the nursery at this time. Holy God – I strive to follow you in all I do and say. But I know I often come up short. Each day I set out to love my neighbor. But I’m often too busy, or too distracted or too worn out with my own problems to really reach out. Each day, O God, I try to do what is required of me…to love you and love your people. Continue to guide me as I fumble, continue to lead me as I fear, and continue to forgive me as I fall short. But wanting to justify himself, he asked Jesus, “And who is my neighbor?” Jesus replied, “A man was going down from Jerusalem to Jericho and fell into the hands of robbers who stripped him, beat him, and went away, leaving him half dead. Now by chance a priest was going down that road; and when he saw him, he passed by on the other side. So likewise, a Levite, when he came to the place and saw him, passed by on the other side. But a Samaritan while traveling came near him; and when he saw him, he was moved with pity. Creator God – we see ourselves in this gospel message. We have neighbors in our community that we would rather simply pass by. We have been the priest crossing the street to avoid a fearful situation. We have been the Levite avoiding confrontation and conflict in order to maintain our comfort or ignorant bliss. Help us, O God, to be the Samaritan you teach about. Help us to create places of community where no one turns their face away or avoids the path of another. Make for us places of peace and sanctuaries in the streets. In our world, O God, which of these three are we? In our Global church, O God, which of these three are we? When we hear of people without access to clean water, or little girls without access to education, or global diseases with cures but no access to healing, we feel stuck. You call us to radical hospitality, yet we continually wonder what the minimum is that we can get away with. You call us to care for the whole person, yet we pick and choose which causes to champion or vote for. You call us to love, yet we try to make that love about us. Forgive us when our global reach is only far enough to pat ourselves on the back. – When we speak, discern and lead within our churches we are standing on Holy Ground because we are rooted and grounded in love. We are called to take off our shoes in humility. – The love of Christ is far greater than the knowledge that each one of us has. – We can only grasp the breadth and length and height and depth of God’s love when we love one another. – Every single child and family in heaven and on earth takes their name from God. – Who is God calling us to be at this moment? Who are we? Whose are we? During these past couple weeks, as I have prayed and attempted to discern not only my answers but my feelings on these statements, I have recognized that the Holy Spirit has come into my life from different angles and movements and this coming into my soul has caused me to reflect back on a number of encounters with others that I have had. I have become open to seeing possibilities on who we are as the Claybanks United Methodist Church within our community, our United Methodist denomination and as Christians. For the past two years one of my functions as your pastor has been to assess how healthy is the Claybanks United Methodist Church. 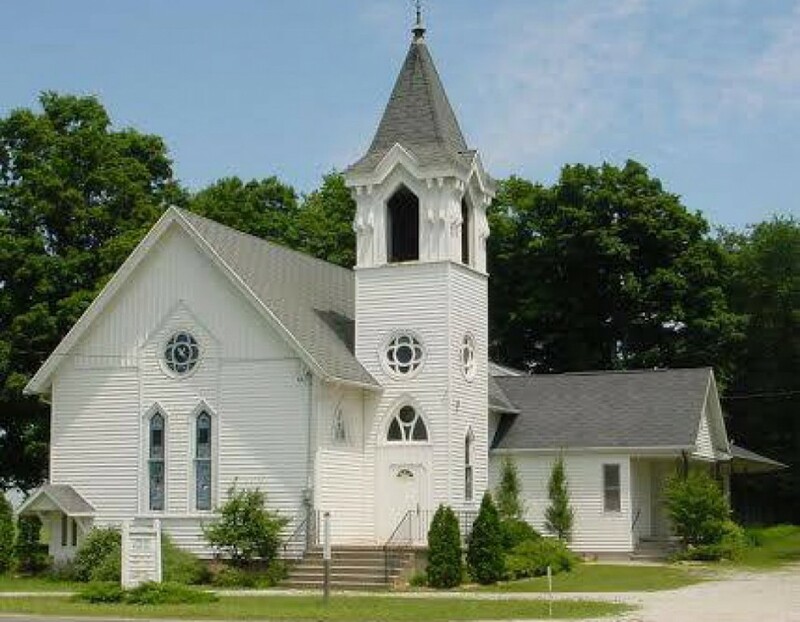 My response to those who asked the question, is that Claybanks United Methodist Church is one of the healthiest congregations within the Michigan Area Conference of the United Methodist Church. That being said, there is one area that has come to my attention because of some recent encounters – we and most churches withdraw and do not assert ourselves and share God’s grace with others. We wait for, “opportunities” rather than opening the doors wide. Many churches, the United Methodist denomination and other denominations, are on a slow decline. While there are many reasons for this, I do believe that one reason is we are not blessing others because we do not share the grace of our Lord Jesus Christ openly. Within our congregation we love each other and receive many blessings when we come together to worship and fellowship within the Claybanks United Methodist Church congregation. But we and so many other Christians, churches, and denominations miss the opportunities to share God’s love, grace and mercy with those around us. Why do we do this? Primarily because we don’t want to be offensive by being, “too churchy”. Too often when we are with others and the subject of, “Do you know the Lord Jesus Christ as your Savior and are you attending worship” comes up, we are proud and excited to share that we attend Claybanks United Methodist Church and what a blessing it is for us. To the point that this is such a personal blessing, we hold it for ourselves and miss a chance to share the blessing with all of God’s people. So, we fall short by not saying, “Come join us”! I, as a pastor, also fall short by not always extending an invitation to attend “my church”. I try to use the excuse that I and many of those who I come in contact with live quite a distance from Claybanks. But I should be encouraging those I meet to attend one of the many churches close to where they live and work. To do this is to use the power of the Holy Spirit. Jesus Christ has commanded us to share our faith with those around us. When we share the love, grace and mercy of our Lord and Savior Jesus Christ, we are truly opening our hearts, our minds and our spirits to the greatest gift we have ever received and that is Jesus Christ as our Savior. We as Christians must get excited and share the Word of God, the peace of Jesus Christ and the Fellowship of the Holy Spirit with all of those who God has sent into our lives. The openings are there, and we have the words, for the Holy Spirit empowers us to share our faith with all of God’s children. I/we must share our faith and be invitational with all of God’s people as we journey hand-in-hand with our Lord and Savior Jesus Christ for eternality. Share God’s Grace! It is a gift to be shared. The Holy Spirit goes with you. We would like to thank everyone from the bottom of our hearts for the benefit luncheon for Debbie. We thank those who planned it, made food, served, cleaned up afterwards and all the donations. Claybanks United Methodist Church family is amazing in all that you can do. We are happy to be a part of this church. We also are very thankful for all your prayers for Debbie. God Bless you all. The UMW is happily anticipating the Fall and the Advent season! Yes, that happy and sometimes stressful time of year is rapidly approaching! Our next meeting in October will be a time of reflection on our past year’s activities. Our treasurer reported on our finances and she will send this year’s annual donations to the five organizations we support. For our old business, we talked about the new pew coverings and that they will be tightened by Alan of R-Custom Fabric. We also shared the joy over the completed Nigerian well project and that the check was presented to Father Peter during the September Ad Council meeting. For new business, we started planning for the decorating of the church for Christmas. Of course, that also means…A PIZZA PARTY!!!!!! Yes, once again UMW ladies will eat pizza and then decorate the church in late November, the Thursday after Thanksgiving. Remember we always welcome new members to our women’s committee, even this late in the year. New members can help decorate and eat pizza! Save the date of Saturday, Oct 13th from 10:00 am to 1:00 pm. Diane Hicks and Edith Brown are hosting a “canvas and brown bag lunch” for all who are interested. This should be lots of fun and best of all, there’s no talent needed, anyone is welcome! Please bring a jar to rinse brushes, spray bottle, and your own brushes if you have them as well as your own brown bag lunch. Canvas, paints and brushes will be provided. Cost will be $10. RSVP to Reba at 321-869-3373 or 616-901-7002. Thank you to all who participated in the fund drives to purchase a well for the Nigerian people. The Claybanks United Methodist Church family banded together to make a huge project a doable project. We are a small church, but a caring, loving and generous church who, when they see a need in the world, is willing to help all they can. Thank you CUMC!!!!! Job well done!!!! October 28th – Begin collecting Thanksgiving canned and boxed goods for the food pantry at Lebanon Lutheran Church – until Nov.12th. One: Who is wise and understanding among us? All: Those who seek wisdom and understanding each and every day. Those who delight in God and meditate on God’s law. One: Come, learn more about wisdom from above, a wisdom that yields a harvest of righteousness. All: O God, your wisdom is more precious than jewels! We draw near to you. Reminder: Don’t forget the luncheon for Deb Aebig following today’s service. Let’s send her off with lots of love and prayers. Claybanks Church is having a luncheon fundraiser for one of our own, Deb Aebig, who will be going to Chicago to undergo a stem cell transplant. We, as a church, want to help defray Deb’s medical costs and also send her off with lots of love and prayers. One: Just as the heavens burst forth in praise to God…. All: We celebrate God’s abundant and powerful love. One: Day by day, and night by night…. All: God watches over us, loving and healing us. One: Come, celebrate with joy the love of God. All: Open our hearts and spirits, Lord, and teach us your ways. AMEN.